Completing appointments is a good way to make sure that all the necessary tasks have been done for that appointment, such as posting procedures, scheduling the next recare appointment, gathering contact information, and collecting a payment. On the calendar, you can see at a glance which appointments have been completed because those appointment tiles will be a gray color. Also, to help you complete all the necessary appointment tasks, you can turn on the workflow compliance feature for any location. On the Patient Routing panel, click (or tap) the Complete status button. On the Calendar page, click (or tap) an appointment. 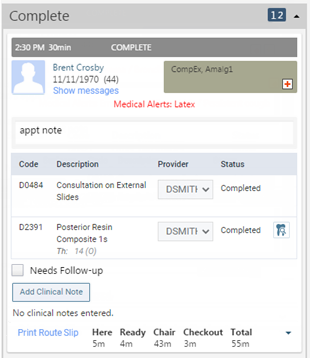 On the Appointment Information panel, change the appointment's Status to Complete, and then click (or tap) Save. 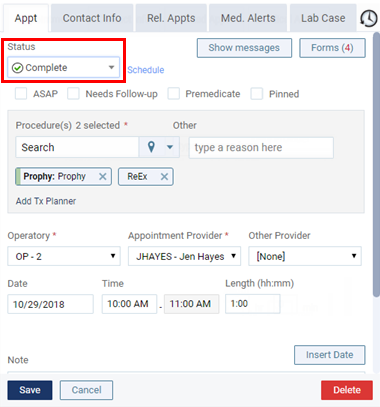 If any of the appointment's procedures have not been posted (either from the routing panel or from the progress notes), the Post Procedures Complete dialog box appears. Post the recare procedures and any other procedures as needed by clicking (or tapping) the corresponding Post buttons. Then, click (or tap) Complete Appt. 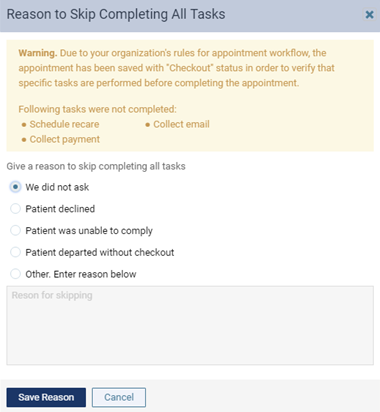 With workflow compliance: If there are incomplete tasks on the routing panel, a warning message appears, and the incomplete appointment tasks on the routing panel have a yellow background. 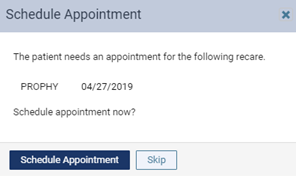 Note: The appointment status will remain as "Checkout" until you complete all the appointment tasks or until you specify a reason for not completing all the tasks. Complete all the appointment tasks, or at least those that can be. 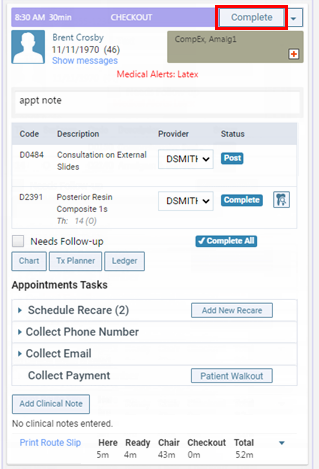 Add New Recare - Click (or tap) the button to attach recare types to the patient's record or to modify or remove recare types. 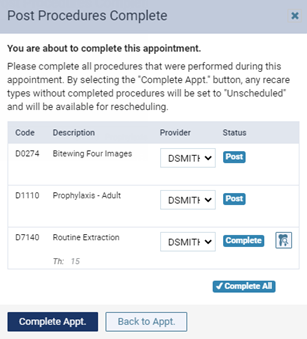 Schedule Recare - After all the necessary recare types have been attached to the patient's record, click (or tap) Schedule Recare, and then click (or tap) the Unscheduled link to schedule the next recare appointment. Note: Only primary recare types are required. Collect Phone Number - Click (or tap) to enter a contact phone number. Collect Email - Click (or tap) to enter a contact email address. Collect Payment - Click (or tap) Patient Walkout to enter a payment and perform other actions (such as creating claims) in the Patient Walkout dialog box. 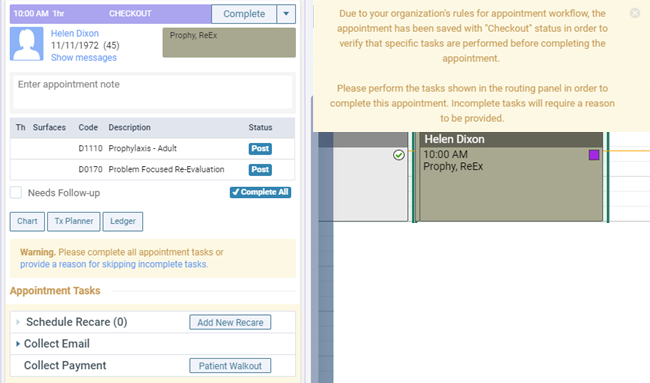 If all appointment tasks are now complete (the yellow background disappears, and the tasks have green check mark symbols next to them), complete the appointment from the routing panel or the appointment information panel. Ignore the steps that follow. 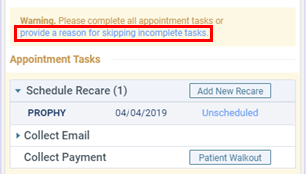 If all appointment tasks are still not complete, click (or tap) the provide a reason for skipping incomplete tasks link. Proceed to the next step. The Reason to Skip Completing All Tasks dialog box appears. Select a reason why tasks were not completed. If you select Other, enter an explanation in the box provided. Click (or tap) Save Reason to complete the appointment. If you did post the recare, the Schedule Appointment message appears. Click (or tap) Schedule Appointment to schedule the patient's next recare appointment. 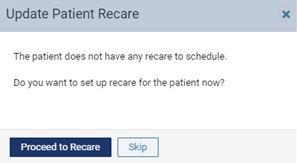 If you did not post the recare, the Update Patient Recare message appears. Click (or tap) Proceed to Recare to attach the correct recare to the patient's record. Next, you will need to schedule the next appointment for the newly attached recare type (using the Unscheduled link). 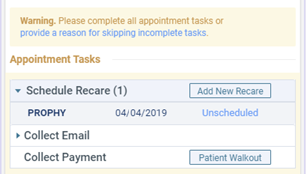 Note: If you complete the appointment without posting the recare procedure and without scheduling the next recare appointment, the due date of the corresponding recare type attached to the patient does not get updated, and that recare type becomes unscheduled for that patient. The corresponding patient now appears under Complete on the Patient Routing panel.